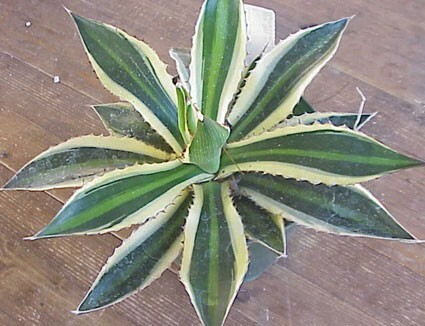 Extremely showy variegation with no two showy armed leaves striped in the same precise pattern. 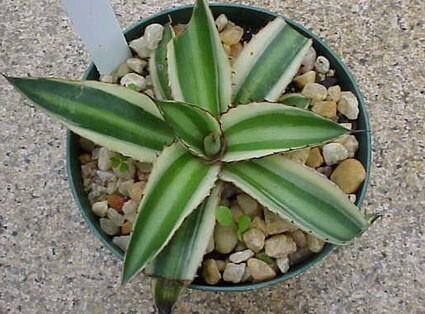 Waxy Central American (thus, intolerant of extended chill, but tolerant of watering year round) collector's favorite with striking stripes and ornately toothed margins forming thick compact mounded outlines which as it becomes mature, often develops a cute litter of offsets dangerously peeping out from under mother's armed skirt. 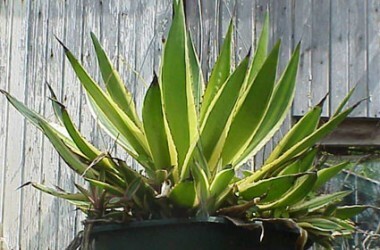 Perhaps the most interesting and uniquely colorful of all of the variegated forms of Agave--and most assuredly one of the easiest to cultivate.